Fats are an important building block for the body and should never be completely eliminated. Many diet plans stress the importance of eating a balanced diet and healthy amounts of fats. Some fad diets may cut too much fat and in that case, are not healthy diets. Healthy diets focus on balancing carbohydrates and protein with some fats included. The reason for this is that fats contain certain vitamins that are only “fat-soluble” and fat helps deliver them to the body properly. Fat soluble vitamins are vitamins A, D, E, and K.
Including fats in your diet in a healthy way takes the proper knowledge of which fats to eat and how much of them. Good planning will help you incorporate a healthy amount of fat into your diet and keep yourself within a healthy weight range. It is also important to understand how bad fats can affect your health other than weight. Complications of eating too much unhealthy fat include circulatory disease, strokes and heart attacks. In order to find the answer to the question "how much fat should I eat", let’s take an in-depth look at the different types of fats and learn about how they affect your body first. Fat is a necessary part of our diet and we need it for the fat-soluble vitamins and for energy. Healthy fats can also our body burns fat to create fuel and help our cells function. It is important to understand the different types of fats and their effects on your body. When we talk about fats that we eat, we refer to them as lipids. To identify lipids, we break them down into two categories: oils (liquids) and fats (solids). These two types of lipids are further broken down into whether they are good for your health or very unhealthy. Fats that are good for you have benefits to your heart health, skin and may even prevent certain diseases. Fats that are bad for you can affect your health negatively and therefore should be taken in moderation. When we have our lipid or cholesterol levels checked three levels are looked at; the bad cholesterol LDL (low density lipoprotein), the good cholesterol HDL (high density lipoprotein) and another bad fat, triglycerides. When the good cholesterol is low, we are encouraged to eat more of them. When the bad cholesterol is high, we need to watch our intake of bad fats in our diets. 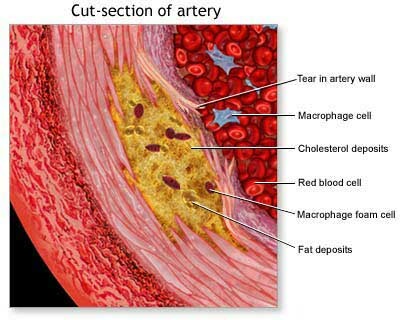 Saturated Fat: Saturated fats are solid fats that do not dissolve easily in the bloodstream. Their molecules attach themselves to the inside of the arteries and can contribute to heart disease. If they are not completely used up for energy, they are also stored in the body as fat stores for later use. This can contribute to weight gain and obesity. It is hard to avoid saturated fats since they are the solid fats in most foods that we eat. They are what give foods their rich texture. Examples of saturated fats are meat, milk, cheese, ice cream, baked items and chocolate. Trans Fat: Trans fat is the worst kinds of fat that you can eat. These fats actually start out as a vegetable oil and artificial processes are used to make them into solids. This type of fat is cheaper for commercial food companies to use and they have absolutely no nutritional value. The other downside is your body cannot break them down. Some examples of foods containing trans fats are:commercially fried foods (most food companies in the U.S. have been banned from frying in products containing trans fats), margarine, shortening, doughnuts and commercially baked pastry items. 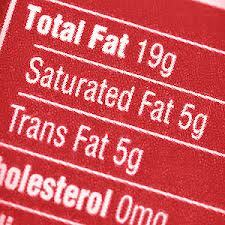 It is important to check food labeling for another name - partially hydrogenated oils, which is a clue that the food item contains trans fats. Your intake should never exceed 1% trans fats. Polyunsaturated Fat: These types of fats are thinner and oily in texture. They dissolve easier in the body and actually can help to dissolve the bad fats in the body. They still need to be taken in moderation, but are necessary for good health. The sources of these fats are fish (Omega-3 fatty acids), sunflower/Grapeseed oil, nuts and leafy greens. These fats are shown to help prevent heart disease and even reduce the incidence of breast cancer. Studies show they may also be protective against insulin resistance in the body, which can help to keep blood sugar levels stable. They also have a good effect on neurotransmitters in the brain. Some studies even show that polyunsaturated fatty acids my help reduce the risk of acquiring Lou Gehrig’s disease. Monounsaturated Fat: These types of fats are the middle of the road. There are no claims that they are bad for you or good for you. These fats do not dissolve as easily as polyunsaturated fats, however they are helpful in actually reducing the LDL (low-density lipoprotein) or bad type of cholesterol. Most of the foods containing monounsaturated fats are included in a Mediterranean diet, which is shown to help prevent heart disease. Foods containing monounsaturated fats are avocados, olive oil, olives, whole milk, nuts, oatmeal, canola oil and peanut oil. Adding these foods to your diet in moderation may be very helpful to your health. The amount of fat intake every day is a percentage of your total calorie intake. You first will need to determine how many calories you need to eat each day to be healthy. Then you will perform a calculation to determine the percentage of those calories can come from fat. Many people cut too much fat from their diet and end up in “starvation” mode. The body then tends to store fat cells for future use. The best way to eat fat is to try to eat exactly what your body needs. The average daily calorie intake is between 1,600 and 2,800 every day. The amount depends on the amount of activity you do, your body weight and your age. Children, teens and active adults need around 2,200 up to 2,800 calories a day. It is important to try to eat as close to your required daily intake as possible. Taking in too little calories will rob you of needed nutrients and taking in too many calories will cause weight gain. When trying to lose weight, it is best to cut only minimal calories form the diet and increase exercise to burn more fat calories than you take in. 1. First, we need to determine how many calories your body needs each day. You will first need to determine your BMR (Basal Metabolic Rate), and then determine your AMR (Active Metabolic Rate). Your Basal Metabolic Rate is your body’s natural ability to burn calories at rest and Active Metabolic Rate will be your caloric needs for your level of activity. For Women: (1) Take your weight in pounds x 4.35. Add 655. (2) Take your height in inches x 4.7. (3) Add number 1 to number 2. (4) Multiply your age x 4.7. (5) Subtract number 4 from number 3. This is your BMR. For example: A 44 year old woman at 145 pounds and 64 inches tall. For Men: (1) Take your weight in pounds x 6.23. Add 66. (2)Take your height in inches x 12.7. (3)Add number 1 to number 2. (4)Take your age in years x 6.8. (5) Subtract number 4 from number 3. For example: A 45 year old man, weighing 151 pounds and 68 inches tall. For example: The woman above goes to the gym 3 days per week. Her AMR is 2139. This is the total amount of calories she needs to eat each day to remain at the same weight. Calculating your BMR and AMR can also be accomplished simply by using BMR calculator (http://www.calories-calculator.net/BMR_Calculator.html) and AMR calculator (http://www.calories-calculator.net/Daily_Calorie_Calculator.html). 3. Lastly, we will determine the amount of fat she should be eating each day. Fat calories are a percentage of the total calories eaten each day. On a 2139 calorie a day diet for an adult, 20% to 35% of those calories should come from fat. Children ages 2 and 3 need slightly higher amounts, at 30% to 35% fat and children ages 4 to 18 need 25% to 35% fat calories. Keep in mind that calories from saturated fats are a lot less, at less than 7% per day. You will need to check your food labels carefully. Listed will be “fat grams.” Try keeping a diary of fat grams that you eat each day. Eat only lean meats and keep processed and commercially baked goods to a minimum. How much fat you should eat each day is simple from here on out, just take your calorie needs and multiply by 20% - 30%. For example: Take the amount above for the woman 2139. So she should eat anywhere between 428 to 642 calories from fat. Then we divide these numbers by 9. She can eat 48 to 71 grams of fat each day. She can also only have 7% of her daily calorie intake from saturated fat. Trans fats need to be minimal or none every day, at less than 1% of your calorie intake. It is recommended that people with high cholesterol levels stay near the bottom number at 20%, but healthy individuals should eat somewhere near the center of the numbers at about 25%.